I’m almost positive someone wise and famous once said something about “spoonies just wanting to have fun.” It’s possible I misheard them. Regardless, spoonies do wish to have some fun even if it requires a bit of forethought, planning and precisely 47 improvisations. 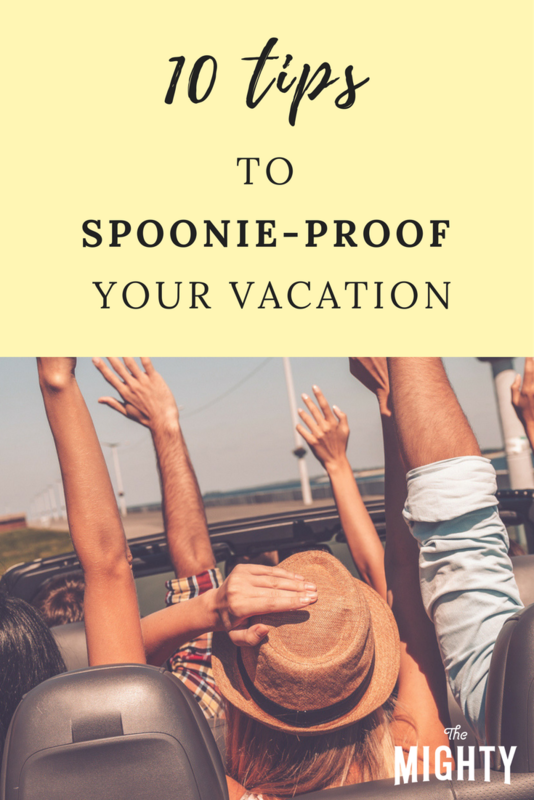 Whether you’re summoning all of your courage and reward points to go overseas or taking a road trip with your besties to the beach, being prepared can make all the difference between the trip of a lifetime and spending your whole vacation in a dark hotel room trying to sleep off a flare. This isn’t your first rodeo. In the unfortunate event you’re forced to see a doctor who isn’t familiar with your medical history, it will speed things up, prevent potential interactions and unnecessary catastrophes if you can present a list of your current medications when seen. It also means you might get away with writing “see attached” on those 10 pages meant for writing all your meds on. Hand cramps? None for you, thank you very much. Daily, rescue and “just in case.” This is one of those times where being over-prepared is the winning way to go. No one wants to be in another city or country when “that thing” that hasn’t happened in two years happens again, and they have no meds for it. So bring the meds, just in case. Murphy’s law dictates by simply bringing the meds along you’ll actually prevent “that thing” from happening on your dream trip. But leave them at home? And you, friend, are tempting fate in a way I dare not. You are far braver than I. Did you need those pills once in your life? Toss them in the bag just to be safe. Better safe than sorry is the guiding principle here. I mean, if you have supportive and cute shoes, then please, provide the link where you purchased these anomalies, otherwise, don’t worry about cute. Pack the shoes your body needs. Are you prone to overheating? Are you heat intolerant? Do you need to dress in layers? Real talk – is there a chance you might pee your pants if the lines are too long at your favorite venues? Pack for all those possibilities. Might it rain, soaking through your socks and supportive shoes? Pack backups. Do you need a backpack to keep your ostomy supplies in? I say you need bug spray no matter where you’re going, so throw that in the backpack too, pretty please. Travel is exhausting. No matter how much fun you’re having, you’re also taxing your immune system and all of your body’s resources. Whether or not you generally use your assistive devices in public, it’s probably a good idea to bring them on your trip. You may well find you tire out much more quickly than expected, or that your body is simply unable to navigate some portions of your trip without them. Hopefully, you never have to use this list, and if printed out, it can ultimately be used for spitting your gum out in before boarding your flight home. However, if something unexpected should occur, you’ll want to know where the doctors who practice in the field needed are located, if they take your insurance, would be willing to see you in a pinch, etc. before you’re in a crisis. Knowledge is power. Simply being equipped with this information can make an emergency in a foreign city or country much less scary and unnerving. In the instance your friends or partner are trying to locate care for you in an emergency, this, along with your medication list, will be the gifts that keep on giving. Since your doctor knows you and your history best, there’s no one better to talk to should you begin sprouting new or unusual symptoms while away. Ask before you take off on your grand adventure if he or she would be willing to guide you should you have any troubles while away. Would they be willing to guide or consult with a local doctor on the scene? People are loud and annoying. (Did I say that? Sorry.) You’ll be exhausted. Light and sound may be a trigger for unhappy things. Perhaps you’ll be sharing a room with your besties or even the tiny, noise-making humans you created. Trust me, you’ll need the mask and ear plugs. If you are prone to joint swelling and pain or if you have chronic pain of any kind, these items are your long time friends. You are most likely quite familiar with “heat, ice, repeat.” If done while wearing your eye mask and ear plugs, it can be quite lovely. You’ll most likely be pushing your body to the max, and you’ll want to have the tools to soothe it a bit at the end of each day. You may even want to start each morning by icing your ailing members before pain sets in. With all the fun you’ll be having, you may not think about all the new germs you’ll be meeting. Every hotel you enter, every plane seat you sit in will be swarming with them. So sanitize those hands and areas like your life depends on it! (Because, you know, it might.) Clip a travel size hand sanitizer to your wallet and purse (or Murse?). Pack the travel wipes in your bag for untidy surfaces you may encounter. If you need to go full mask in order to protect yourself on the plane or densely populated areas, there’s no shame in your game. You make that mask look good, baby. Take a shameful amount of selfies and have so much fun! Because, you know, YOLO!